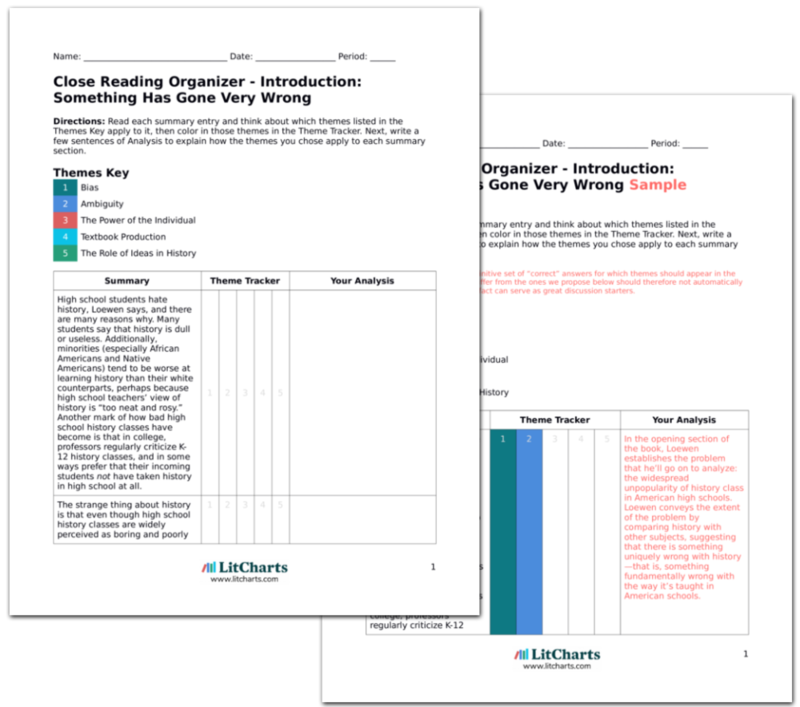 Instant downloads of all 946 LitChart PDFs (including Lies My Teacher Told Me). 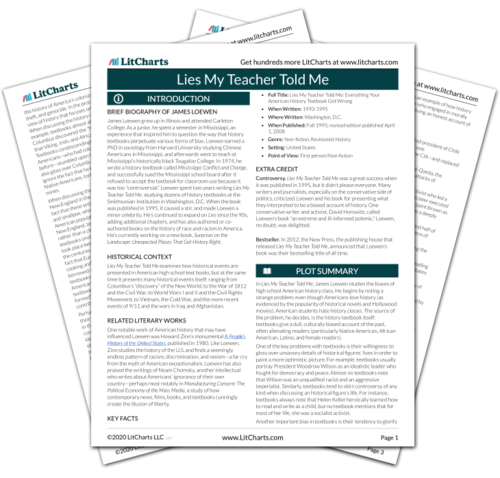 Welcome to the LitCharts study guide on James Loewen's Lies My Teacher Told Me. Created by the original team behind SparkNotes, LitCharts are the world's best literature guides. A concise biography of James Loewen plus historical and literary context for Lies My Teacher Told Me. A quick-reference summary: Lies My Teacher Told Me on a single page. In-depth summary and analysis of every Chapter of Lies My Teacher Told Me. Visual theme-tracking, too. Explanations, analysis, and visualizations of Lies My Teacher Told Me's themes. Lies My Teacher Told Me's important quotes, sortable by theme, character, or Chapter. Description, analysis, and timelines for Lies My Teacher Told Me's characters. Explanations of Lies My Teacher Told Me's symbols, and tracking of where they appear. An interactive data visualization of Lies My Teacher Told Me's plot and themes. James Loewen grew up in Illinois and attended Carleton College. As a junior, he spent a semester in Mississippi, an experience that inspired him to question the way that history textbooks perpetuate various forms of bias. Loewen earned a PhD in sociology from Harvard University studying Chinese Americans in Mississippi, and afterwards went to teach at Mississippi’s historically black Tougaloo College. In 1974, he wrote a history textbook called Mississippi: Conflict and Change, and successfully sued the Mississippi school board after it refused to accept the textbook for classroom use because it was too “controversial.” Loewen spent two years writing Lies My Teacher Told Me, studying dozens of history textbooks at the Smithsonian Institution in Washington, D.C. When the book was published in 1995, it caused a stir, and made Loewen a minor celebrity. He’s continued to expand on Lies since the 90s, adding additional chapters, and has also authored or co-authored books on the history of race and racism in America. He’s currently working on a new book, Surprises on the Landscape: Unexpected Places That Get History Right. 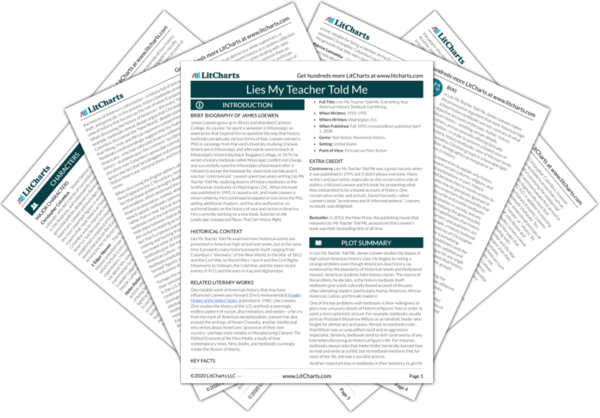 Get the entire Lies My Teacher Told Me LitChart as a printable PDF. Lies My Teacher Told Me examines how historical events are presented in American high school text books, but at the same time it presents many historical events itself: ranging from Columbus’s “discovery” of the New World, to the War of 1812 and the Civil War, to World Wars I and II and the Civil Rights Movement, to Vietnam, the Cold War, and the more recent events of 9/11 and the wars in Iraq and Afghanistan. One notable work of American history that may have influenced Loewen was Howard Zinn’s monumental A People’s History of the United States, published in 1980. Like Loewen, Zinn studies the history of the U.S. and finds a seemingly endless pattern of racism, discrimination, and sexism—a far cry from the myth of American exceptionalism. Loewen has also praised the writings of Noam Chomsky, another intellectual who writes about Americans’ ignorance of their own country—perhaps most notably in Manufacturing Consent: The Political Economy of the Mass Media, a study of how contemporary news, films, books, and textbooks cunningly create the illusion of liberty. Controversy. Lies My Teacher Told Me was a great success when it was published in 1995, but it didn’t please everyone. Many writers and journalists, especially on the conservative side of politics, criticized Loewen and his book for presenting what they interpreted to be a biased account of history. One conservative writer and activist, David Horowitz, called Loewen’s book “an extreme and ill-informed polemic.” Loewen, no doubt, was delighted. Bestseller. In 2012, the New Press, the publishing house that released Lies My Teacher Told Me, announced that Loewen’s book was their bestselling title of all time. Arn, Jackson. "Lies My Teacher Told Me." LitCharts. LitCharts LLC, 24 Jan 2017. Web. 24 Apr 2019. Arn, Jackson. "Lies My Teacher Told Me." LitCharts LLC, January 24, 2017. Retrieved April 24, 2019. https://www.litcharts.com/lit/lies-my-teacher-told-me.